Leading out on the second pitch of Love Diet. Bob Baribeau’s route, Love Diet, is incredible. All I know about the history is that he rope soloed the route in the mid 90’s, but I can imagine it might have been a lonely day. Love Diet is on a 350′ seldom visited, beautiful and steep cliff called the Laughing Lion. The yellow drips that are the route’s second pitch hang from the left side of a twenty five foot roof. It usually takes until January to come in. 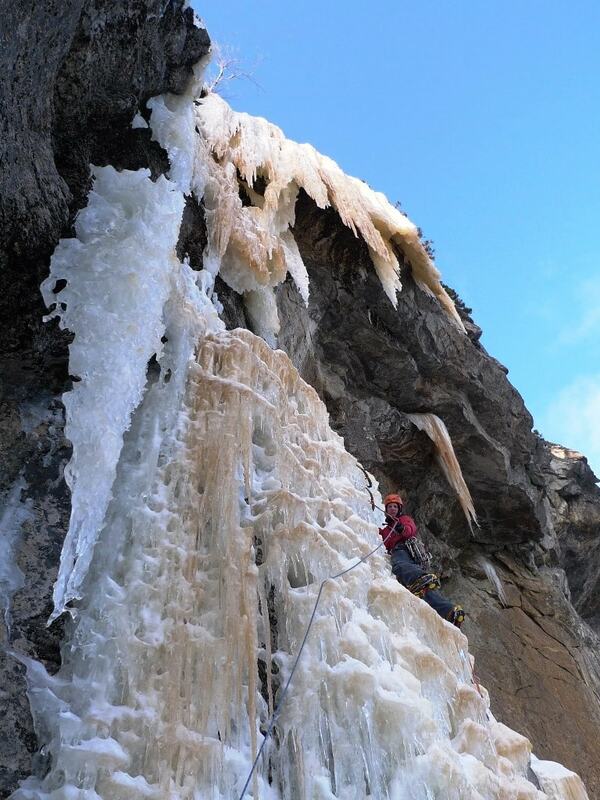 Unlike a route like Dropline, where ice bonds to a vertical wall, Love Diet drips off the edge of the roof, its water droplets free-fall over a hundred feet, building up a mushroomed pedestal and dozens of icicles. On some years a continuous line of ice develops, on many years not. 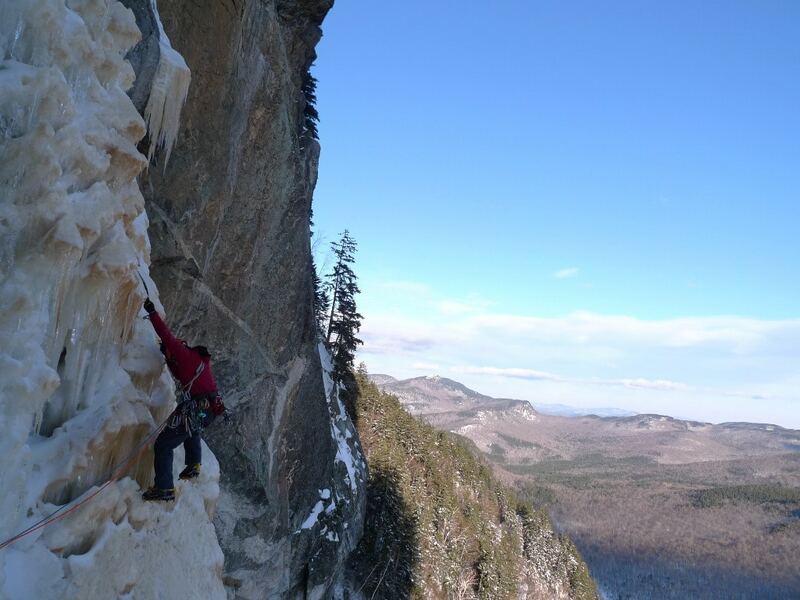 The top of the second pitch overhangs its base. Its lucky we even got to the cliff that day. At 10:30 the night before, after what wasn’t our first beer, Freddy Wilkinson and I hatched a plan to try the route. We were in the middle of a 20″ snow storm and its a five mile ski out there, but that never really crossed our minds. The next morning, after digging out our respective houses, we got on the road at about a quarter to nine. After an hour’s drive to the trail head, the first few miles of skiing went smoothly, thanks to a snow machine packed and groomed trail. Once away from the Ski-Doo trail though, the snow got deep. One of us would break trail, plunging knee deep on skis, while the other would hang back and have a snack. After a ten minute break you could catch up in two minutes only to take the lead. The usual two and a half hour approach took four hours. Somewhere along the trail, where it had seemed especially bad, we had decided that we should call the outing a cardio work out and just try and get to the cliff. Josh Hurst and Ian Austin were coming out the next day, so at least they would have a good trail and somebody would have a chance to send the route. But, after a sandwich and some hot Tang, we got psyched. 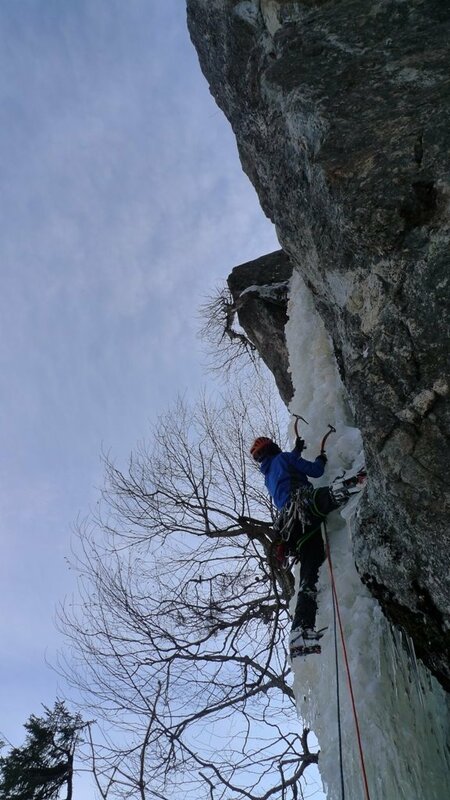 Fred sent a variation to the first pitch, called Love Diet Direct, one of three excellent NEI 5+ pitches that are within fifty feet of each other, and the only one in good condition. Freddy Wilkinson on the Remission part of Love Diet Direct. The pitch is like climbing the Remission column right off the ground only to end up right in the middle of Repentance. He casually fired the candled and impossible to protect first twenty five feet of the pillar, chatting with me the whole time. When he got in the chimney I could hear him hooting with excitement over how good the pitch was. By the time I got to the belay he had the next pitch all mapped out for me, or so we thought. 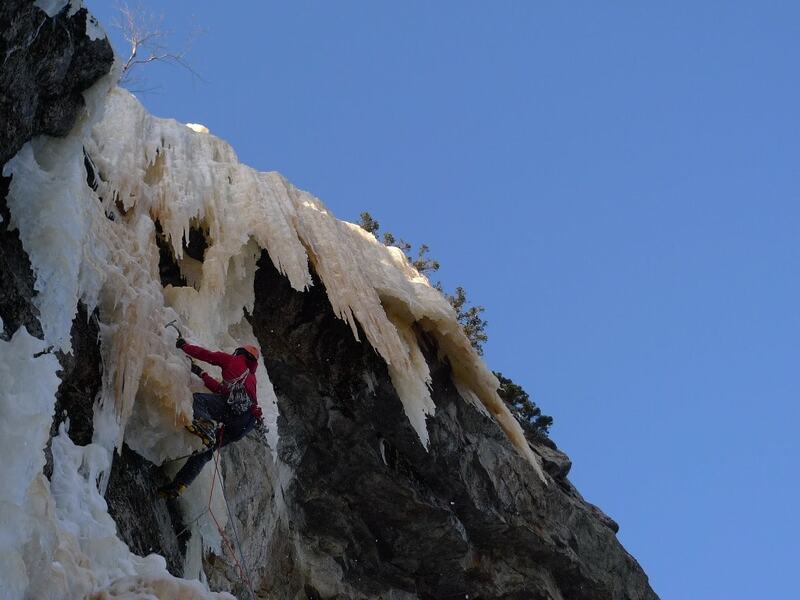 After pulling over an ice roof the climbing got dicey. It was the narrowest neck of the route, sunbaked and poorly bonded. If I hadn’t seen gear past this section of a couple of body lengths I probably wouldn’t have done it. But once past it, with some good rock gear in, the ice came back around and eventually I was able crawl into an ice cave big enough to stand in. This was an incredible position, half way out a huge roof, standing on a perfectly flat blob connected to the back side of an enormous icicle. Off to the right was nothing but air. As I began to down climb to get back in position to finish the pitch, I could see higher up behind the enormous curtains of yellow ice. I noticed a good crack and what looked like a way to get out from higher up. After some wild climbing that sometimes resembled caving more than anything else, I found myself behind a pane of ice thirty feet higher. 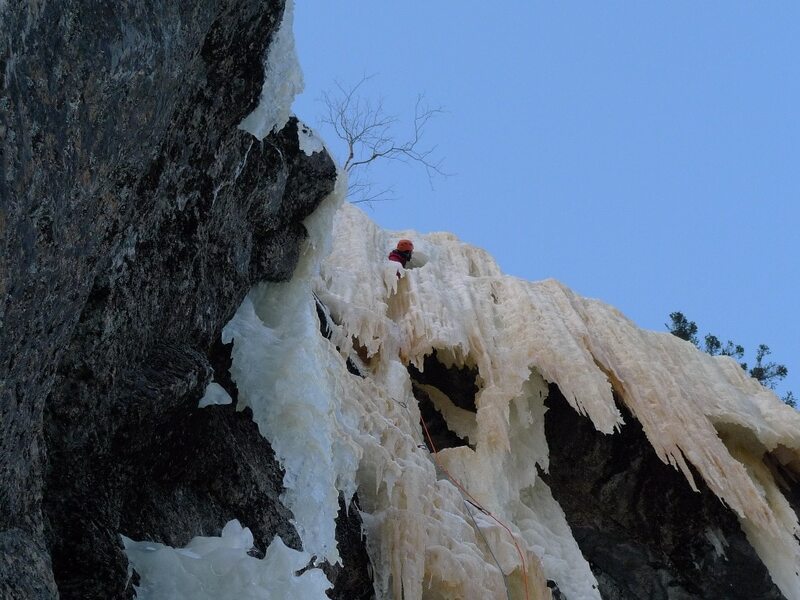 A few minutes of chopping and I was back out on the front side of the ice, way up high on the cliff with only fifteen feet of bombproof vertical ice between me and the trees. Poking my head out the freshly chopped hole high on the route. We got back to the base of the route as it got dark and had a horrific ski out in climbing boots with fifty pound packs in deep snow. It was a beautiful night, but it went unnoticed while I was buried in a bush up to my ears in powder, not able to get up. Luckily the guy who grooms the snow machine trail passed, and by the time we got to the height of land we only had to stand there and slide the remaining few miles back to the truck.